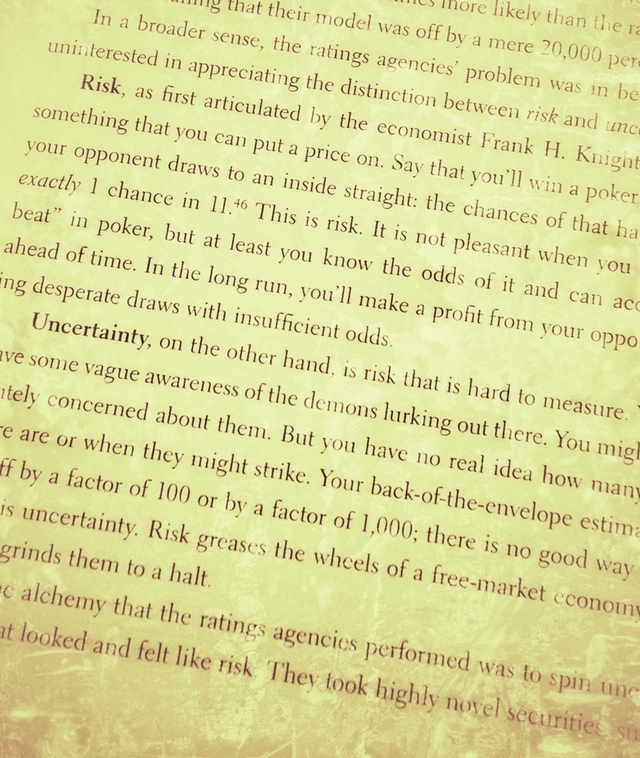 Risk, as first articulated by the economist Frank H. Knight in 1921, is something that you can put a price on. Say that you’ll win a poker hand unless your opponent draws to an inside straight: the chances of that happening are exactly 1 chance in 11. This is risk. It is not pleasant when you take a “bad beat” in poker, but at least you know the odds of it and can account for it ahead of time. In the long run, you’ll make a profit from your opponents making desperate draws with insufficient odds. Nassim Taleb elaborates on the Copernican Principle, a concept first introduced on Farnam Street in How To Predict Everything. For the perishable, every additional day in its life translates into a shorter additional life expectancy. For the nonperishable, every additional day implies a longer life expectancy. So the longer a technology lives, the longer it is expected to live. Let me illustrate the point. Say I have for sole information about a gentleman that he is 40 years old and I want to predict how long he will live. I can look at actuarial tables and find his age-adjusted life expectancy as used by insurance companies. The table will predict that he has an extra 44 to go. Next year, when he turns 41 (or, equivalently, if apply the reasoning today to another person currently 41), he will have a little more than 43 years to go. So every year that lapses reduces his life expectancy by about a year (actually, a little less than a year, so if his life expectancy at birth is 80, his life expectancy at 80 will not be zero, but another decade or so). The opposite applies to nonperishable items. I am simplifying numbers here for clarity. If a book has been in print for forty years, I can expect it to be in print for another forty years. But, and that is the main difference, if it survives another decade, then it will be expected to be in print another fifty years. This, simply, as a rule, tells you why things that have been around for a long time are not “aging” like persons, but “aging” in reverse. Every year that passes without extinction doubles the additional life expectancy. This is an indicator of some robustness. The robustness of an item is proportional to its life! This is the “winner-take-all” effect in longevity. The main argument against this idea is the counterexample — newspapers and traditional telephone lines come to mind. These technologies, widely considered inefficient and dying, have been around for a long time. Yet the Copernican Principle would suggest they will continue to live on for a long time. The Copernican Principle: How To Predict Everything — Based on one of the most famous and successful prediction methods in the history of science. Ten Commandments for Aspiring Superforecasters — The ten key themes that have been “experimentally demonstrated to boost accuracy” in the real-world. Philip Tetlock on The Art and Science of Prediction — How we can get better at the art and science of prediction, including diving into makes some people better at making predictions and how we can learn to improve our ability to guess the future. An event like an earthquake happens, making it more available in our mind. Some events are hard to predict. This becomes even more complicated when you consider not only predicting the event but the timing of the event as well. This article below points out that experts, like the rest of us, base their predictions on inference from observing the past and are just as prone to biases as the rest of us. Why do people over infer from recent events? There are two plausible but apparently contradicting intuitions about how people over-infer from observing recent events. The gambler’s fallacy claims that people expect rapid reversion to the mean. For example, upon observing three outcomes of red in roulette, gamblers tend to think that black is now due and tend to bet more on black (Croson and Sundali 2005). The hot hand fallacy term originates from basketball where players who scored several times in a row are believed to have a “hot hand”, i.e. are more likely to score at their next attempt. 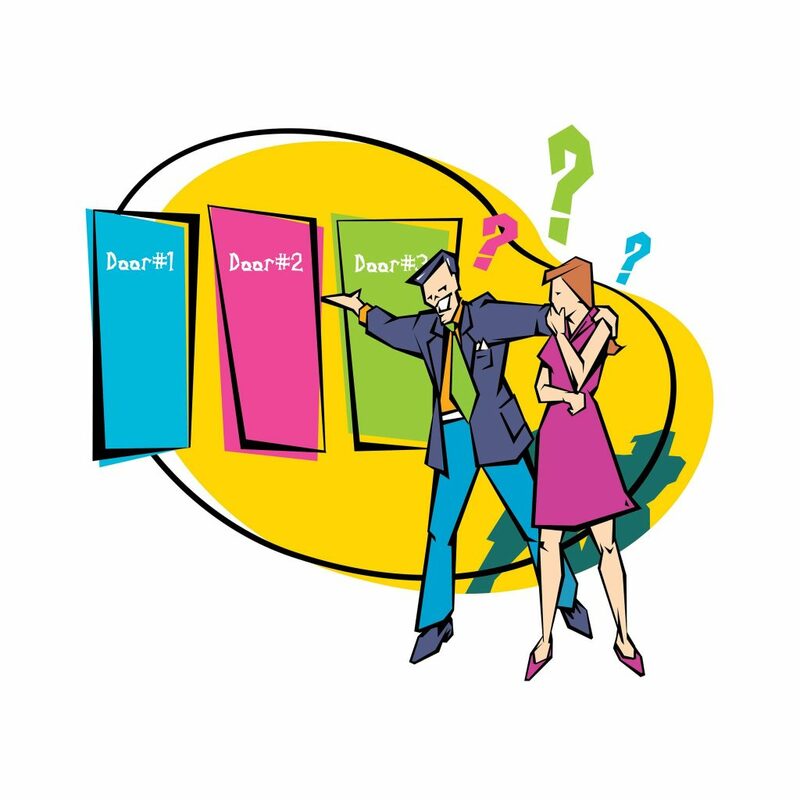 Recent behavioural theory has proposed a foundation to reconcile the apparent contradiction between the two types of over-inference. The intuition behind the theory can be explained with reference to the example of roulette play. A person believing in the law of small numbers thinks that small samples should look like the parent distribution, i.e. that the sample should be representative of the parent distribution. Thus, the person believes that out of, say 6, spins 3 should be red and 3 should be black (ignoring green). If observed outcomes in the small sample differ from the 50:50 ratio, immediate reversal is expected. Thus, somebody observing 2 times red in 6 consecutive spins believes that black is “due” on the 3rd spin to restore the 50:50 ratio. Now suppose such person is uncertain about the fairness of the roulette wheel. Upon observing an improbable event (6 times red in 6 spins, say), the person starts to doubt about the fairness of the roulette wheel because a long streak does not correspond to what he believes a random sequence should look like. The person then revises his model of the data generating process and starts to believe the event on streak is more likely. The upshot of the theory is that the same person may at first (when the streak is short) believe in reversion of the trend (the gambler’s fallacy) and later – when the streak is long – in continuation of the trend (the hot hand fallacy). Ahh, the famous game show problem (also known as The Monty Hall Problem). When you switch, you win 2/3 of the time and lose 1/3, but when you don’t switch, you only win 1/3 of the time and lose 2/3. You can try it yourself and see….. The winning odds of 1/3 on the first choice can’t go up to 1/2 just because the host opens a losing door. To illustrate this, let’s say we play a shell game. You look away, and I put a pea under one of three shells. Then I ask you to put your finger on a shell. The odds that your choice contains a pea are 1/3, agreed? Then I simply lift up an empty shell from the remaining other two. As I can (and will) do this regardless of what you’ve chosen, we’ve learned nothing to allow us to revise the odds on the shell under your finger. The benefits of switching are readily proven by playing through the six games that exhaust all the possibilities. For the first three games, you choose #1 and “switch” each time, for the second three games, you choose #1 and “stay” each time, and the host always opens a loser.